So when I heard about a running campaign on Facebook that encouraged everyone to change their profile picture with their favorite cartoon character in order to spread awareness about CHILD ABUSE, I readily follow. I hope this campaign will be able to reach its ultimate purpose to help spread awareness about CHILD ABUSE. As to the origin of the campaign, you can view it at the GMA news website. Meantime, I wish to share with you a story about a young survivor of abuse named Angel in my other site. Her story first appeared in People’s Tonight (a Manila-based Tabloid) a few years ago. * This is my Facebook profile picture now. 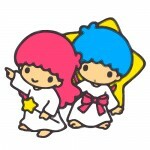 Kiki and Lala, popular Sanrio characters. This entry was posted in For a good cause and tagged cartoon character, child abuse, Facebook campaign, profile picture on December 3, 2010 by Yami. I also join this campaign. Such story really breaks my heart leaving me teary eyed and I can never imagine someone i know or close to me will suffer the same fate.